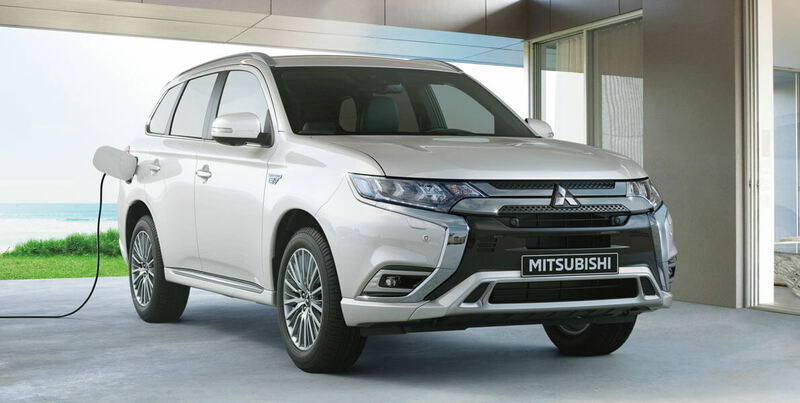 The Mitsubishi Outlander PHEV has become such a popular vehicle in the UK that it previously accounted for an incredible 50% of sales in the EV and PHEV sector (electric vehicles and plug-in hybrid vehicles), with over 100,000 sold in Europe as of January 2018 and outselling the likes of the BMW 330e, Mercedes C350 and Nissan Leaf. Its huge popularity is likely to be related to its impressive economic efficiency, four-wheel drive and a practicality that is non-existent in many of today’s PHEVs. The updated 2019 Mitsubishi Outlander PHEV is a distinctive vehicle and there’s not much like it on the market at the moment – in the same price-bracket, at least – with the BMW and Mercedes SUV PHEVs being bigger and far more expensive. 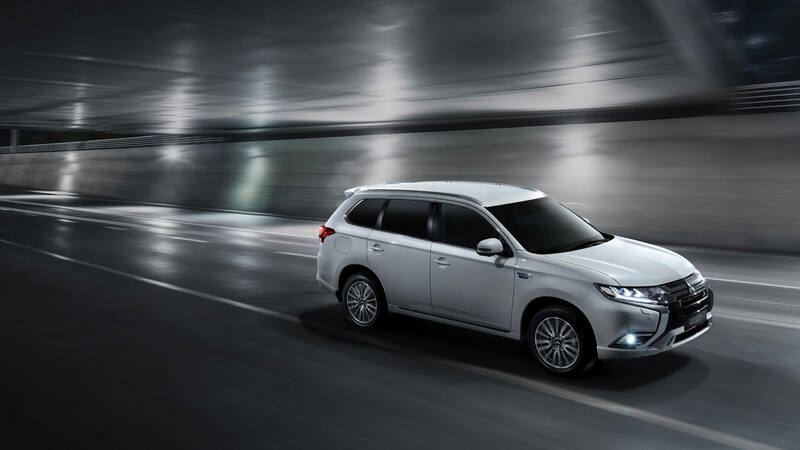 Outlander PHEV ownership begins with the Juro, which includes stylish black leather seats, 18inch alloy wheels and an electronic parking brake. As you get to the more deluxe trims, like the 4HS, you get features such as a Forward Collision Mitigation System with pedestrian detection, lane departure warnings, automatic high beam, and front and rear parking sensors. We’re currently offering lease deals for the Juro, 4H and 4HS, but our team are always on-hand to help you choose which version best suits your needs, so don’t worry if you feel overwhelmed with options! The Mitsubishi Outlander PHEV’s price in the UK ranges from £36,755 for the entry-level Juro, increasing to £46,060 for the flagship 5HS. This one-off payment can make quite a significant dent in your bank account, whereas leasing often makes it more affordable. Here at Complete Leasing, we have deals starting at just over £560 (incl. VAT) a month! Don’t hesitate to get in touch with us today, obligation-free. The Outlander PHEV is a good-looking SUV – it may not be as spectacular as the likes of the Maserati Levante, but it looks the way an SUV should, blending all-important practicality with a hint of luxury. Let’s start at the front. There’s a lot of storage room, with compartments and cup-holders everywhere you’d want them, and the added carbon fibre elements add to the high-quality feel that wasn’t so visible in the previous version. The centre console buttons are easy enough to use, and a seven-inch infotainment screen comes as standard in all models. Mitsubishi hasn’t bothered including a built-in navigation system, as drivers can use their smartphone instead (not while driving, of course), and the company has also said that their customers aren’t really bothered. It would be nice to have the option, though! 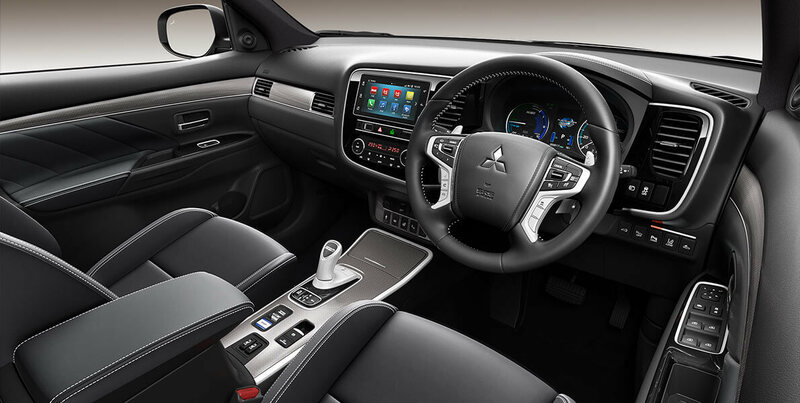 The leather used is more up-market than anything else we’ve seen in a Mitsubishi, and the driver’s seat has been adjusted to provide a higher and more comfortable driving position. If you’ve got kids, you’ll be glad to hear that the cabin is solid and durable, much like the rest of the vehicle. It’s a relatively simple interior, but what it lacks in tech, it makes up for in practicality. Being a tall, somewhat square SUV, head-room is naturally good for people of all sizes. You also get plenty of leg room and foot space, as the floor is completely flat and gives you plenty of room to manoeuvre. 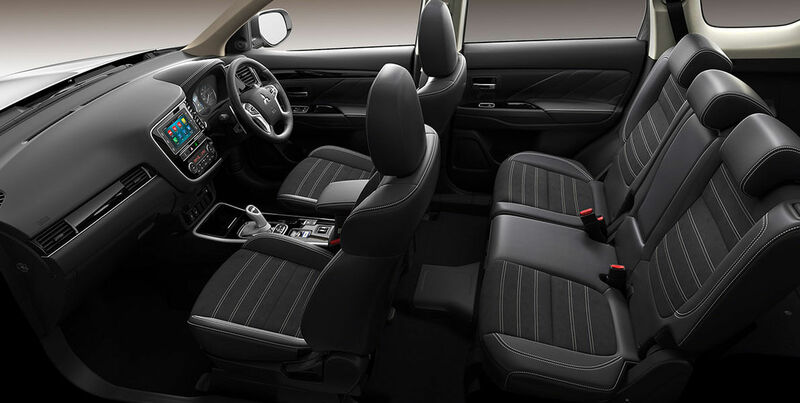 Three passengers, whether they’re children or adults, can fit in the back with ease due to the vehicle being so wide. You’d probably expect as much in a larger car, but not many SUVs nowadays actually cater to the realistic practical needs of its owners – the Outlander does. Unlike the petrol Outlander, there’s no seven-seat option, which is the one sacrifice of owning the PHEV version (and one worth making, for that matter). The electric motor and batteries are located beneath the boot which limits its size, but it’s completely flat so sliding heavy objects in-and-out is a breeze. The Outlander PHEV has received an upgrade for 2019, but that’s not to say it looks much different to the previous version on the outside. This isn’t your typical ‘facelift’ - it’s more of a transplant, because what really matters in this upgrade is what’s under the bonnet (and under the boot, in this case). There’s more than meets the eye to the upgraded 2019 Outlander PHEV. 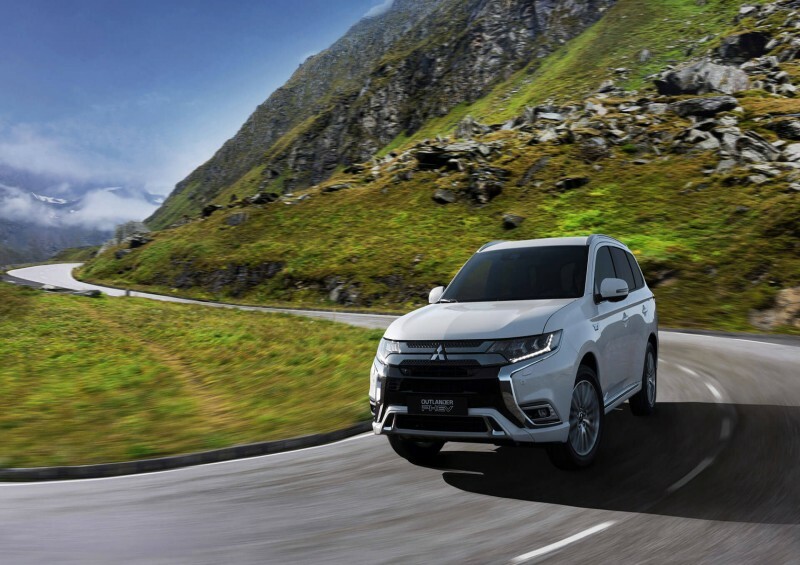 Replacing the old 2.0-litre engine is a new 2.4-litre Atkinson-cycle four-cylinder engine – giving the Outlander a huge power increase and improving its economic efficiency. Further upgrades include a new, more powerful e-motor and an increase in generator and battery capacities, as well as refinements in terms of brakes, steering, suspension, all-wheel drive, and hybrid control system. Its new motor has increased in power from 119bhp to 133bhp and torque from 140lb-ft to 156lb-ft, setting a faster 0-62mph time of 10.5 seconds – 0.5 seconds quicker than the previous version. 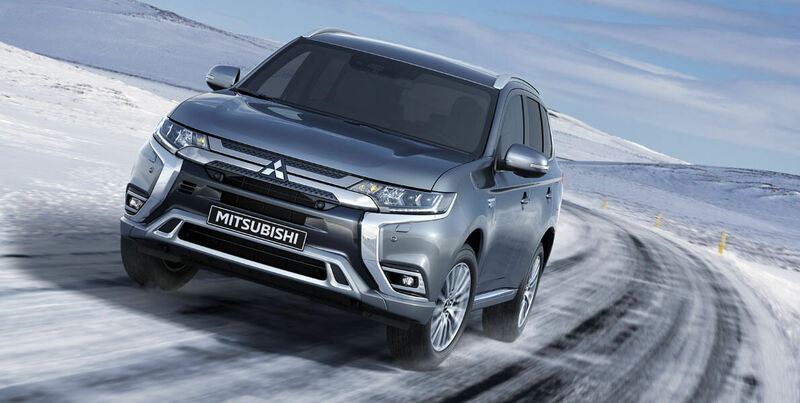 Mitsubishi claim that the combined engine and electric max power output is 165 kW (221bhp), with the Outlander PHEV able to cruise on electric power alone at an impressive 84mph. Alone, EV-mode has a range of 28 miles, which is ideal for drivers who work and commute locally. Considering it takes just 25 minutes to charge to 80% with rapid charge and four hours with a standard three-pin plug, its range is praiseworthy. There are quite a lot of different driving modes to get used to, such as a Sport Mode and Eco Mode, all-wheel drive ‘Snow’ and ‘Lock’ modes, as well as Normal, Save and Charge options for the powertrain. You’ve also got six levels of regenerative braking, which is operated by paddles behind the steering wheel. These modes generally give you options of changing how the electric motor and internal combustion engine (ICE) are used. 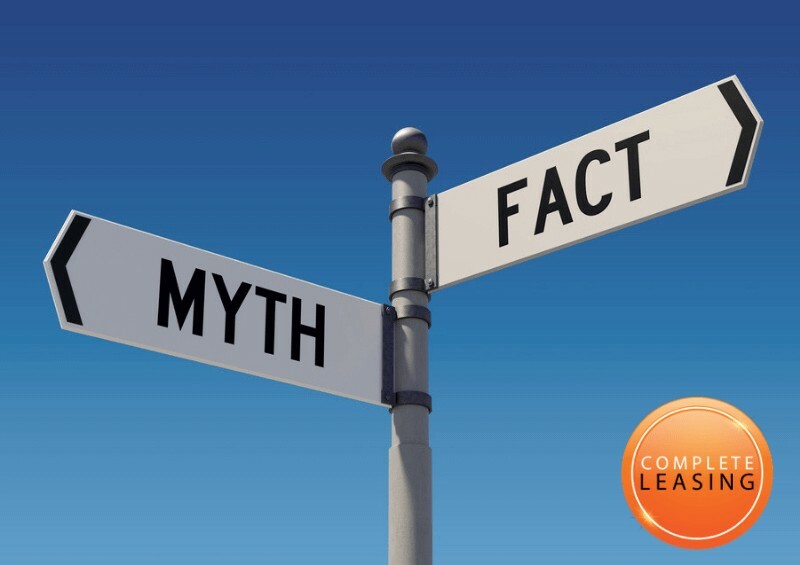 You’ll get used to it all in time, and our petrol heads at Complete Leasing are always ready to answer any questions you may have! 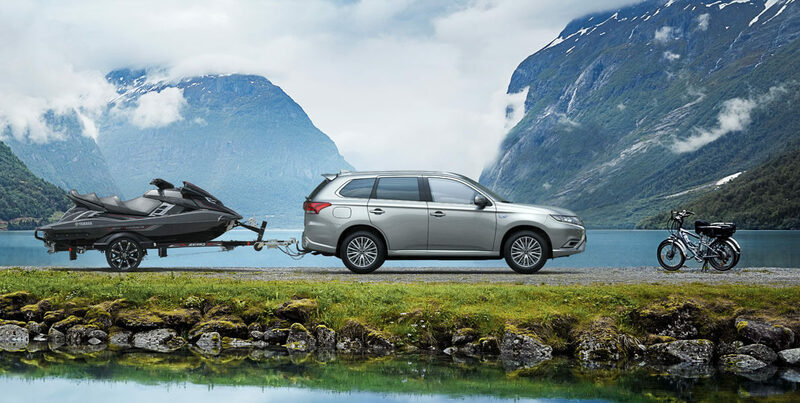 With its new, refined engine, the Outlander PHEV provides a quiet and comfortable ride. You also get some good acceleration in EV mode, and it’s easy enough to drive without using the ICE too often. It may not be quite as smooth as its more expensive counterparts, but the updated front and rear shock absorbers have reduced the jerkiness of the ride considerably. On the motorway, there’s barely any road noise and (unlike many SUVs) wind noise isn’t much of a problem at all. The Mitsubishi Outlander PHEV is a practical, stylish and cheap-to-run SUV with good fuel economy (141mpg) and a tiny tax bill. If you want an SUV PHEV that offers genuine practicality and great value-for-money for shorter, local journeys, there’s no reason why you wouldn’t want one. 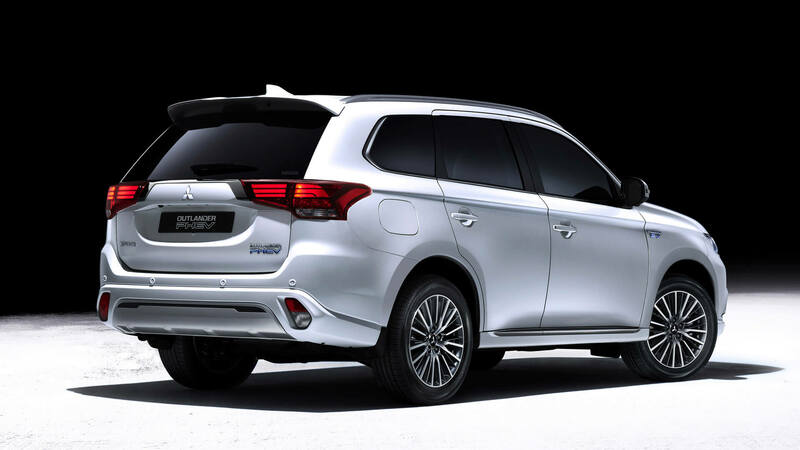 At the time of writing, our Mitsubishi Outlander PHEV lease deals start at £568.75 (incl. VAT) a month, with a three-month initial rental payment of £1,706.25 (personal contract hire), which we may be able to alter depending on your budget. We also have business contract hire deals available, costing from £467.96 (+VAT) a month. Feel free to browse all of our offers online and get in touch with us today for more information, either by calling us or completing our short contact form. Be sure to follow us on Instagram, Facebook, Twitter and LinkedIn to keep up with our latest leasing deals!